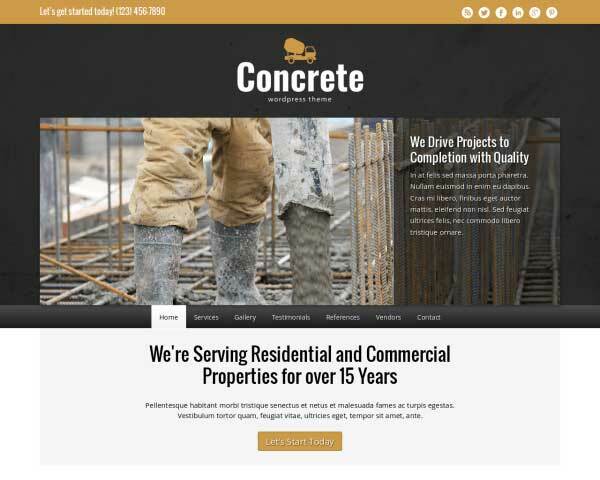 Why start from scratch when your construction website can be more than halfway finished right out of the box? 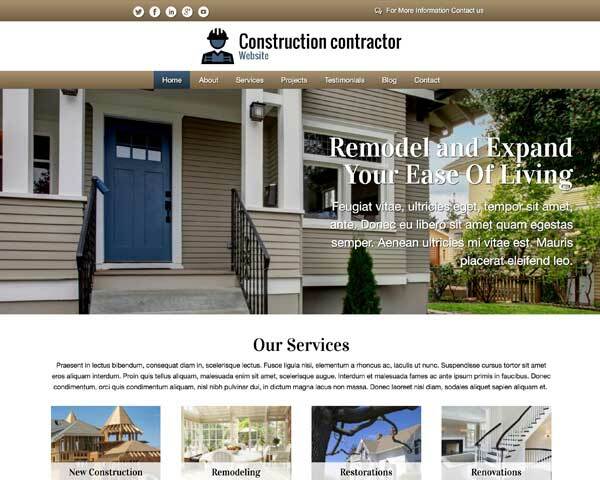 The Construction Contractor WordPress Theme is pre-built with all the important pages and features in place. Customize the look and layout without any coding at all! 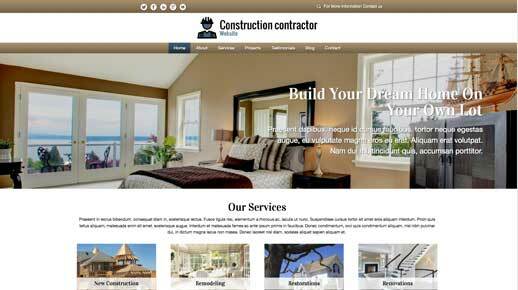 The Construction Contractor WordPress Theme blends a great-looking design with smart features and a solid layout. 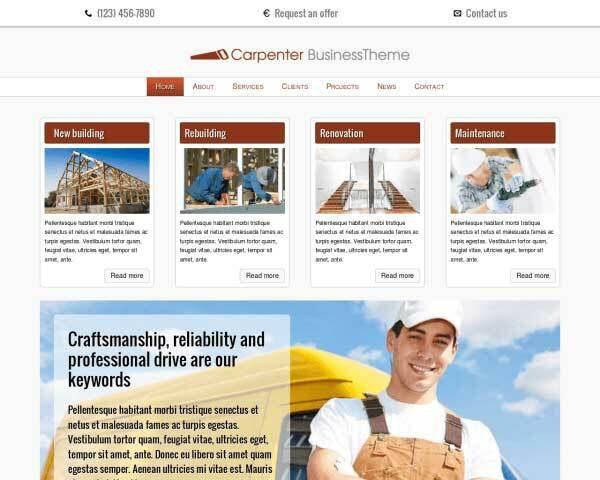 Making it altogether a great theme to get your construction business online easy and effective. Its content is geared towards construction businesses with clear call-to-actions and a service overview which makes complete sense for contractors. It houses the most advanced front end editing framework in the world with dozens of ready-to-use features to extend and expand your site as you see fit. Altogether making it a sure bet for anyone who want to take it to the next level in this line of work. 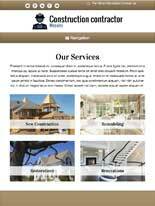 Besides using the main navigation menu, visitors can find a helpful overview of your most popular services on the home page, linking directly to the appropriate page for more information. 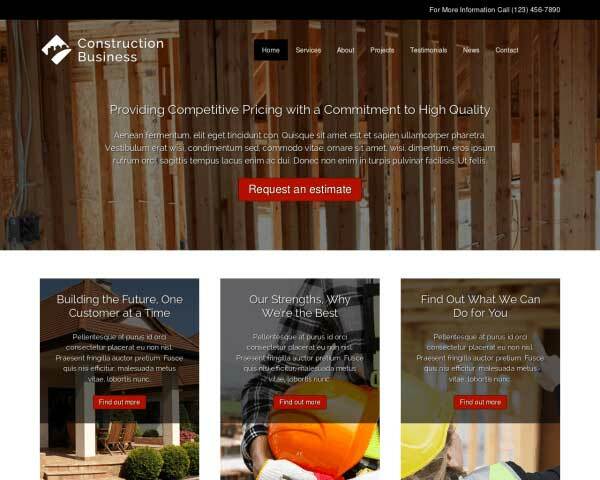 The Construction Contractor WordPress Theme offers placeholders to show engaging visual stimuli in combination with textual call-to-actions. Think about the biggest problems of your target audience and offer your solutions. A pictures paints a thousands words. What better way than to do so with an overview of your most recent projects which updates automatically when new ones are added. Help new customers make up their minds by sharing reviews from existing clients. 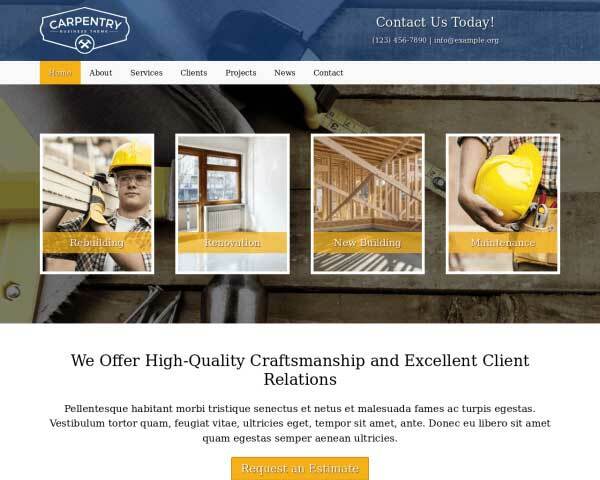 Just replace the text and the Construction Contractor WordPress Theme will style your quotes in this format. 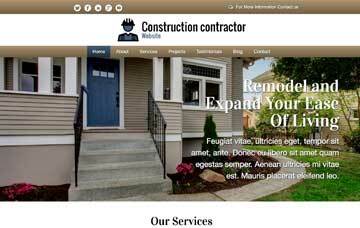 The Construction Contractor WordPress Theme has a place to add your business' trust icons. Either the associations you're part of or the brands you use, or both, can be placed here. 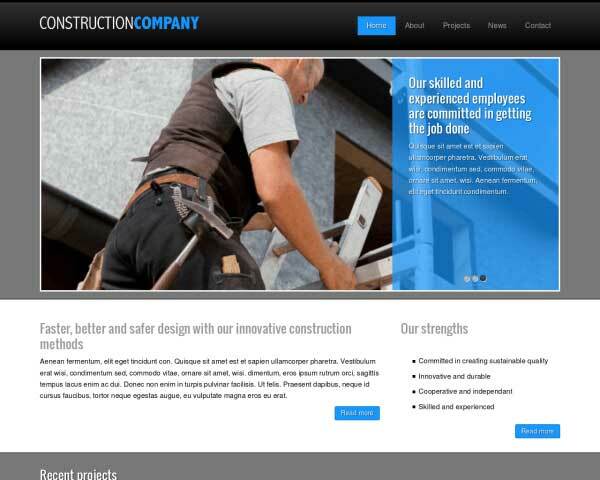 The Construction Contractor WordPress Theme comes with icons for the most popular social media platforms. Visitors can connect with you online or share your content on their own pages. 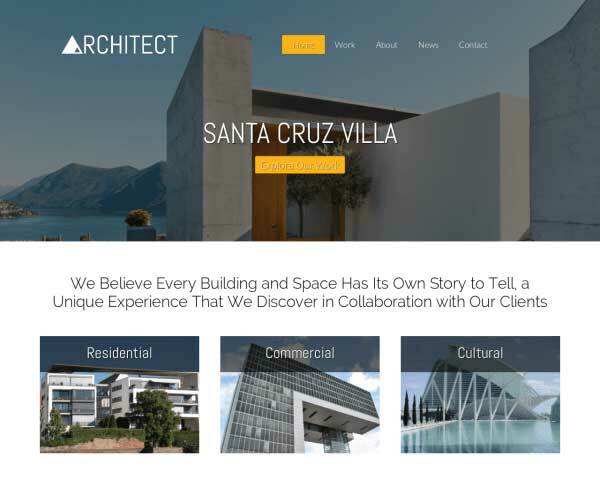 Setting up a dedicated page of what your clients can expect from you conveys professionalism and channels the right expectations concerning your construction services. Each project detail page is set up with space for photos and text and can be easily customized without any coding. Use widgets to add more images, text, a photo gallery or videos. 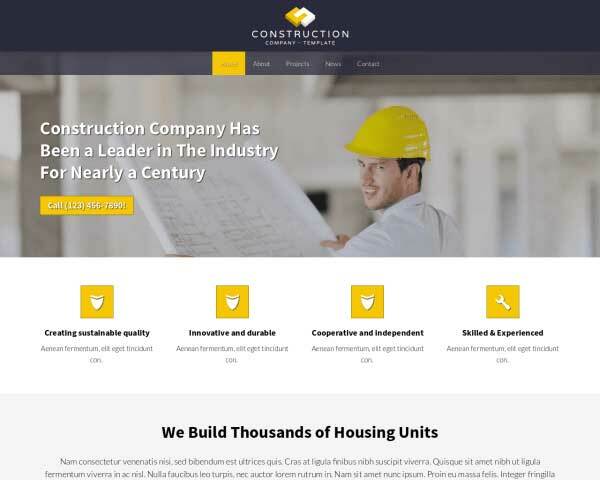 With our responsive Construction Contractor WordPress Theme, the mobile version of your construction website will make a great impression even on small screens. Right out of the box, this website template's mobile-optimized design will automatically adjust the layout of your text and photos to display neatly on any screen size. Clients who use smartphones and tablets to view your pages will enjoy the same dazzling full-width images and user-friendly functionality of the desktop version, so they can check services, read your blog or watch videos anywhere, any time.